More on the Twin Peaks Tunnel centennial on the Outside Lands San Francisco podcast, and an OpenSFHistory photo gallery. February 3, 2018 marks the 100th anniversary of the official opening of the Twin Peaks Tunnel. The first streetcar through the tunnel was a landmark event in the decentralization of the City of San Francisco. Prior thereto, the city’s population was concentrated in the downtown area and there was little development in the vast sand dunes areas of the Outside Lands as the western half of San Francisco was affectionately known then. The tunnel would spur development and make the city what it is today. The process of getting there, however, was far from easy. San Francisco is divided fairly evenly in half by a set of mountains, Lone Mountain, Mount Sutro, Twin Peaks, and Mount Davidson. At the turn of the twentieth century, most San Francisco homes, jobs, and stores lay to the east of these mountains, from downtown to Hayes Valley to the Mission District. 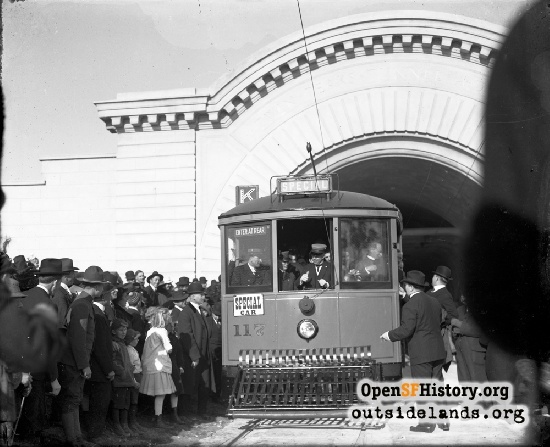 Around and north of Golden Gate Park, streetcar and train lines were built to get people to the park, Cliff House, and Ocean Beach. So there were small patches of development in the Inner Richmond and Inner Sunset Districts but Mount Sutro, Twin Peaks and Mount Davidson prevented effective public transportation from reaching the western slopes, the vast majority of the Sunset District and open land around Lake Merced. On May 27, 1909, the semi-annual banquet of the Merchants’ Association was held in the ballroom of the St. Francis Hotel. The theme of the banquet was “Our Civic Center and the Need of Street Railroad Development.” Various merchants spoke about the need for rail improvements in the city and centralizing the various rail lines under one management. During hay merchant A.W. Scott, Jr.’s speech, he noted that too many people who worked in San Francisco were forced to live in other communities. Scott noted, “[t]ake the splendid home district out beyond the Twin Peaks. That is a most desirable locality, but at present people cannot get there without a loss of much time and at great inconvenience.” Scott proposed a subway to the area beyond Twin Peaks which Merchants’ Association members estimated would cost $1,500,000. Scott wanted United Railroads, which had a number of street car franchises in the city, to construct the subway, but suggested that the City should build it if United Railroads would not. Another factor in the push for a Twin Peaks tunnel was a California Supreme Court ruling that Adolph Sutro’s will was invalid as being too uncertain to be a legally binding document. The effect of this ruling was that Sutro’s vast real estate holdings in the Outside Lands would be sold off, including many areas beyond Twin Peaks which could be subdivided for homes. This would lead to greater interest in creating a way for people to travel quickly from the areas in the southwest part of the city to the downtown area. 1909 also marked when planning for the 1915 Panama Pacific International Exposition began in earnest after years of raising money. One of the key questions was a site for the PPIE. Various areas in the Sunset District were being discussed because of the availability of the land. There was hope expressed that a Twin Peaks tunnel could be constructed before the PPIE to make transportation to a Sunset District site easy. A lack of such transportation would be a factor in the eventual choice of the Marina District area for the PPIE. One of the key divisive issues of the era was the issue of whether San Francisco should have a municipal railway in competition to the private railway companies. The city had three times in six years put such bonds on the ballot for the creation of a municipal railway. Undeterred by yet another defeat for a municipal railway in June 1909, the city’s Public Utilities Committee issued a report that suggested San Francisco take over United Railway franchises as they expired and expand the existing lines to areas in the Sunset District through a tunnel under Twin Peaks. The report stated that the tunnel could be financed by assessments on the lands that would benefit from it. A fourth bond measure for a municipal railway system on Geary Boulevard was placed on the ballot for December 30, 1909. The Merchant’s Association issued a bulletin in opposition to the measure stating, “[i]f the city wishes to build and operate street railroads now, let it build them where they are needed to furnish transportation to those of its citizens that have none, and where private capital will not build.” The bulletin went on to state that funds should be used instead for the “much needed” Twin Peaks tunnel. Despite the opposition and three former bond ballot defeats, the bonds for the Geary municipal railway passed by an overwhelming 70%. 1910 ushered in a wave of “agitation” for a tunnel to the Sunset District. The Mission Promotion Association, a business group, held a meeting on January 11, 1910 and voted unanimously in favor of three related projects: a bond issue for the city to purchase land held by the Spring Valley Water Company, which included land by Lake Merced where the PPIE could be held, and for a Twin Peaks tunnel so people could get to the fair. 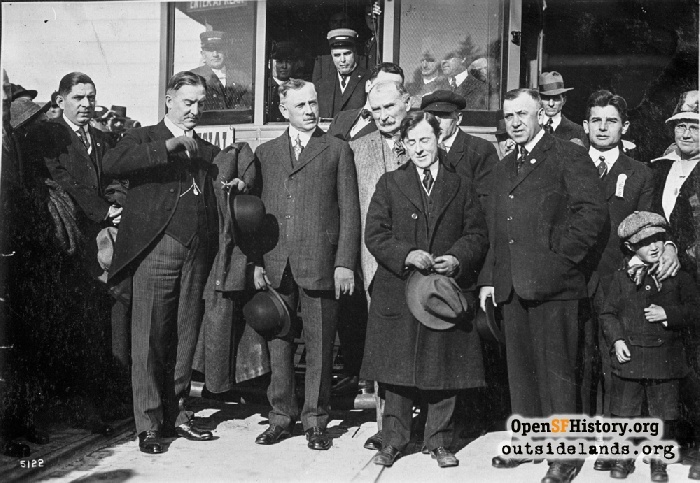 San Francisco’s Irish mayor, Patrick Henry McCarthy, also voiced his support for the project and endorsed the suggestion for an assessment district to finance it. A report done by L.V. Riddle of the Parkside Company, estimated that a tunnel could be bored from 18th and Douglas Streets to the Almshouse tract for $1,500,000. Riddle stated that it would only take a year and a half to complete because the character of the rock was easy for the work and that a streetcar line through Twin Peaks would be of “inestimable value” if the PPIE was located in the vicinity of Lake Merced per one proposal. Meanwhile, various neighborhood improvement clubs took up the effort. On March 21, 1910, a meeting was held with representatives of the Eureka Valley, Upper Market Street, Mission Heights and Church Street, Market and Church Street, Parkside, and Ingleside Improvement Clubs and the Mission Promotion Association. Speakers noted that there were 5,000 acres of land that would be quickly settled if a tunnel through Twin Peaks was constructed. A former Los Angeles city engineer stated that property in districts opened up by tunnels in the Los Angeles area increased in value by 50% within a year. Riddle showed up to suggest that if the city didn’t build the tunnel, that private capital be raised for it. The representatives at the meeting resolved to hold a convention for further discussion of the issue. At a meeting on March 25, 1910, the convention date was set for April 18, 1910 to be held at the New Era Hall on Market Street. At this point, realtors began to try to capitalize on the outcry for a Twin Peaks Tunnel. Classified ads began appearing offering lots in the Sunset District which would “triple” in value once the tunnel was built and the PPIE came to Lake Merced. In 1911, ads for Parkside lots would promise a “direct connection with Twin Peaks Tunnel” years before that would become a reality. The Residential Development Company of San Francisco would purchase a large portion of the San Miguel rancho in 1911 with the idea that these lands would become much more attractive with the advent of a tunnel. As the convention date approached, the city’s neighborhood improvement clubs and civic associations—representing all areas of the city—met and elected delegates to the convention and discussed the positions they would take on the Twin Peaks Tunnel issue. Overall, about 60 organizations would be represented at the convention. The Glen Park Improvement Club announced their opposition to the tunnel ahead of the convention. Most other Improvement Clubs were in favor of the project. At the convention on April 18, 1910, more than 600 people representing the various improvement clubs and civic organizations attended. There were a number of speakers who spoke to the viability and cost of a tunnel under Twin Peaks. Three methods of financing were discussed: an assessment taxed on the districts that would benefit from the tunnel; private capital; or city-wide municipal bonds. Mayor McCarthy strongly endorsed the project and promised that he would do everything in his power to have the city get it done. The convention formed a permanent organization to be called the Twin Peaks Tunnel and Improvement Convention (“TPTIC”) which would seek quick construction of a tunnel. The TPTIC quickly got to work appointing a chairman, Dr. Hartland Law, and a secretary, C.F. Adams. An office was established at Secretary Adams’ office in the Mills Building. Six committees were organized, Ways and Means, Advisory, Publicity, Finance, Judiciary, and Membership. Another convention was set for August 19, 1910. Surveys and reports prepared by engineers and land experts for the next convention estimated that the tunnel would cost slightly more than two million dollars, but would increase city revenue by $300,000 per year. Real estate experts stated that there was 4,000 acres of land that would be purchased in the Outside Lands if a tunnel was built. The August 19, 1910 convention primarily discussed the various means of raising funds for the tunnel. The assessment district plan was stated to be not viable as, until the tunnel was built, there would be insufficient households and businesses in the Outside Lands to be assessed, though it is possible that improvement clubs in the assessment districts did not want their lands to shoulder the burden of the cost. The private capital plan was similarly shot down because it was believed that no private company would finance the tunnel for a franchise that would expire after a number of years. That left the municipal bond plan as the only viable option in the Convention’s estimation and it was adopted by resolution. The convention noted that the tunnel would benefit every San Franciscan, so it was appropriate that everyone share the burden. The resolution set forth that the TPTIC would petition the Board of Supervisors to provide a bond issue in the amount of $2,500,000 for the tunnel. The San Francisco Real Estate Board adopted a similar resolution soon thereafter. The petition was quickly presented to the Board of Supervisors who, on August 29, 1910, referred it to their Streets Committee, at that time consisting of Supervisors Robert Loughery, Cornelius Deasy, and John McLaughlin. However Loughery, wanted the tunnel issue delayed until San Francisco completed a deal to purchase the holdings of the Spring Valley Water Company, which were largely located around the Lake Merced area. Loughery reasoned that if the city were to build the tunnel, it should reap the benefits of already owning the water company’s land assets to the west of the proposed tunnel. The deal would not get finalized until June 1914. Although the TPTIC wanted bonds issued for construction of the tunnel, the Board of Supervisors instead leaned toward the assessment district method for financing. One potential issue—the legality of such an assessment district—came to the forefront in 1911. San Francisco had attempted to impose an assessment district for the construction of the Stockton Street tunnel, but the ordinance was overturned by the California Supreme Court as being unauthorized by the city’s charter. This problem was solved when the California legislature amended the charter law on February 7, 1911 to allow cities to create special assessment districts for municipal works, specifically including tunnel projects. On September 18, 1911, the Board of Supervisors enacted a new ordinance, pursuant to the amended charter law, creating a special assessment district for the construction of the Stockton tunnel. Creation of a Twin Peaks tunnel assessment district was postponed until there was legal determination on the validity of the Stockton tunnel assessment district. A friendly lawsuit was started to get the validity of the ordinance before the California Supreme Court as soon as possible. The Court would approve the new assessment ordinance in early 1912. 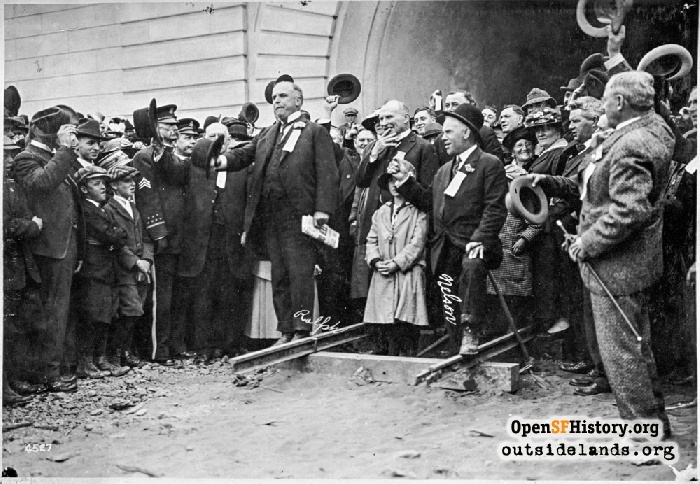 1912 saw a new mayor for San Francisco, James “Sunny Jim” Rolph,” and a city government that really begin to carry the load for a Twin Peaks tunnel project. They hired a Chicago traffic expert, Bion J. Arnold, to study San Francisco traffic issues, including the Twin Peaks tunnel, and make recommendations. Even before a tunnel report was received, the Board of Supervisors passed an ordinance on March 18, 1912 declaring it to be the city’s intent to build the Twin Peaks and three other tunnels. Arnold filed his report with the Board of Supervisors’ tunnel committee on May 3, 1912. His report recommended, without qualifications, that the tunnel be constructed. He further suggested some slight alterations to the tunnel’s path so as to connect more easily with a Market Street subway tunnel that was being talked about. Despite the TPTIC’s opposition to Arnold’s proposed tunnel route and in favor of a shorter tunnel, the tunnel committee passed the report to the full Board of Supervisors with a recommendation in favor of it. The Board quickly adopted a resolution asking the City Engineer Michael O’Shaughnessy to prepare plans for possible construction of the tunnel. On July 22, 1912, the Board of Supervisors unanimously adopted another resolution declaring the Twin Peaks tunnel to be a public necessity and convenience. A second resolution was also passed asking the Board of Public Works to provide cost estimates and data on the Arnold plan. With the Board approval of the tunnel plan idea, local realtors kicked their marketing for Sunset real estate into high gear. Large advertisements noting that the tunnel would be happening were placed in newspapers. Thus, even before the Twin Peaks tunnel project plans were drawn up and the project officially approved, the interest in the Outside Lands was so strong that development was already beginning to the west of Twin Peaks. Forest Hill, Parkside, Ingleside Terraces, and St. Francis Wood were all experiencing growth. On October 7, 1912, Arnold submitted complete plans for the Twin Peaks tunnel (and Market Street subway) to the Board of Supervisors. The plans indicated that public transportation from Sloat and Junipero Serra Boulevard to downtown would take 20 minutes. The eastern portal of his plan was set at Valencia and Market, but property owners and improvement clubs advocated for the eastern portal to be at Eureka for a shorter tunnel and smaller cost. The Board asked City Engineer O’Shaughnessy to prepare cost estimates for both locations of the eastern portal. City engineers also began testing for the tunnel, drilling to the depth of the tunnel to determine what kind of earth construction would face. In December 1912, the Board of Supervisors put a number of city charter amendments up for a vote of residents. Included among these were Charter Amendments 18-21 which authorized the city to widen streets, build tunnels, create special assessments districts, issue bonds, and incur indebtedness for such projects. Though not specifically stated by the Amendments, these amendments essentially sought public approval for the Twin Peaks tunnel and several other transportation projects. San Francisco residents approved all four of these charter amendments at an election on December 10, 1912. The end of 1912 also saw the beginning of San Francisco’s municipal railway. Three years after voter approval for bonds for a Geary Boulevard municipal railway, streetcar service began on December 28, 1912 for Muni’s A-Line and B-Line that started on Market Street and went out Geary Boulevard to the Richmond District. Naturally, this increased interest for municipal streetcar service to more areas in the city. Muni began expanding tracks and lines over the next several years, including a Church Street line that would open in 1917 and would take service closest to the planned Twin Peaks tunnel. San Francisco authorized the City Engineer to prepare detailed plans for the Twin Peaks tunnel in Resolution 10,020, signed by Mayor Rolph on March 7, 1913. Pursuant to the resolution, City Engineer O’Shaughnessy filed a comprehensive report on July 28, 1913 regarding the tunnel, including construction plans and specifications, cost estimates, maps and lists of parcels within the tunnel assessment district, and a list of properties and easements to be obtained for construction. O’Shaughnessy’s cost estimate was nearly $4,000,000. The proposed tunnel was to be more than two miles long with a station inside the tunnel. After O’Shaughnessy’s Twin Peaks tunnel report was released, property owners within the Twin Peaks Assessment District had a limited amount of time to protest assessments. Out of 13,187 parcels within the district, only 218 property owners filed protests. 190 of the protests claimed that they would receive no material benefit from the tunnel. The other 28 protested that their land would be condemned for the tunnel. The protestors represented about $90,000 of the $3,900,000 expected to be raised by the assessments. One vocal opponent of the tunnel plan was Carl Larsen, owner of a large amount of land on the west side of Twin Peaks. Larsen proposed a shorter, less expensive tunnel route where the western portal would be near the proposed Laguna Honda station. He stated the costs of construction could be reduced by 30% under his plan. O’Shaughnessy said Larsen’s plan would require a 4% grade, which would prevent rapid transit through the tunnel, whereas the 2% grade in his plan would accommodate rapid transit. Arnold’s 1912 report had stated that a 3% grade was the maximum for rapid transit. Larsen would take his objection to his assessment to court arguing that no such assessment could be made upon private property. Upon losing at the trial court level in May 1915, he appealed to the California Supreme Court. That court’s decision would not be completed until 1920, well after the tunnel itself was completed. The Court ruled in favor of San Francisco, finding that there was no evidence that Larsen’s land did not benefit from the tunnel and therefore the supervisors’ decision to assess his lands could not be declared invalid. After the protests were heard, some protestors had their assessments reduced. The Board of Supervisors then adopted the O’Shaughnessy plan, rejecting Larsen’s shorter tunnel alternative, on October 20, 1913. Mayor Rolph signed the resolution which also levied assessments on November 6, 1913. Interest in the Twin Peaks Tunnel was so great by this point that the October 1913 California Land Show exhibition in San Francisco, which included 22 California counties, featured an immense relief map of the Twin Peaks Tunnel district and had a tunnel day. In March 1914, the assessor’s office sent out the first installment tax notices to landowners in the Twin Peaks tunnel assessment districts. The notices gave owners until April 13, 1914 to make their assessment payments. By the end of the month, five big real estate developers that held large amounts of land west of the proposed tunnel agreed to pay their assessments, amounting to $924,000, thereby assuring the tunnel project could go forward. The settlement of purchase issues for the Spring Valley Water Company holdings a few months later would guarantee another $1,200,000 for the project. The next step in the process was for the city engineer’s office to prepare a booklet with the specifications for project bids. 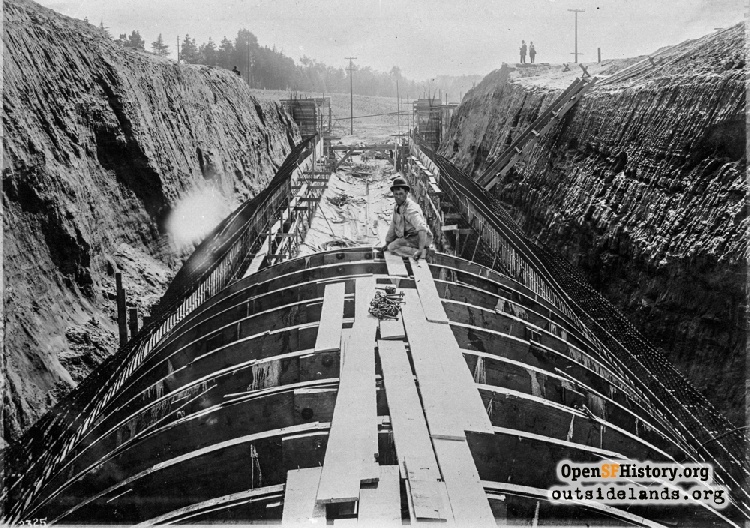 After review of the specifications by the Board of Public Works, the Board of Supervisors, on a unanimous vote, approved Ordinance 2779 on June 8, 1914, which ordered construction of the Twin Peaks Tunnel and authorized a contract for construction to be entered into. The Twin Peaks tunnel job was then put up for bid by the end of June 1914. The notice gave a deadline of August 19, 1914 for companies to submit bids. However, not one single bid was received by the deadline, apparently because of a concern that the money on hand from assessments was not enough to assure contractors of prompt payments. San Francisco gave a new deadline of September 16, 1914 and declared that it would meet with contractors to try to reassure them. That deadline was extended to September 30, 1914 so that eastern contractors would have sufficient time to submit bids. Worried that there would still be no bids received, San Francisco increased the time for the project from 600 to 1000 days and reduced the amount of the bond required. The large development companies with land in the Outside Lands discussed forming their own construction company to build the tunnel. When the deadline passed, there was only one bidder for the project, Hans Pedersen, a Seattle contractor. San Francisco liked Pedersen’s bid and was prepared to accept it. The bid was not made out on the form required by the Board of Supervisors though and it was feared this would invalidate a contract. So the city reopened the bidding with a new deadline of October 28, 1914 so that Pedersen could properly submit his bid. This time, however, three other contractors submitted bids as well. The lowest bid came from Robert C. Storrie & Co. The bids were referred to the City Engineer’s office for review. O’Shaughnessy recommended the Storrie & Co. bid. Finally on Monday, November 2, 1914, San Francisco signed a contract with Storrie & Co. for the construction of the Twin Peaks Tunnel. The contract amount was $3,372,000 and the company immediately began bringing equipment to sites on both ends of the tunnel. The groundbreaking ceremony was set for Saturday, December 5, 1914. Before the appointed day for the groundbreaking, confusion reigned. The Twin Peaks Property Owners’ Association (TPPOA) and city officials had a heated disagreement over the ceremony. The TPPOA claimed that O’Shaughnessy had agreed to speak at the ceremony and that the Mayor and Supervisors would be on hand. O’Shaughnessy refused to speak and said they would not be ready for a groundbreaking for another two weeks. City officials backed O’Shaughnessy and refused to participate, resulting in a cancellation of the ceremony. Although the groundbreaking ceremony was to be rescheduled, there does not appear to be any record of it happening. 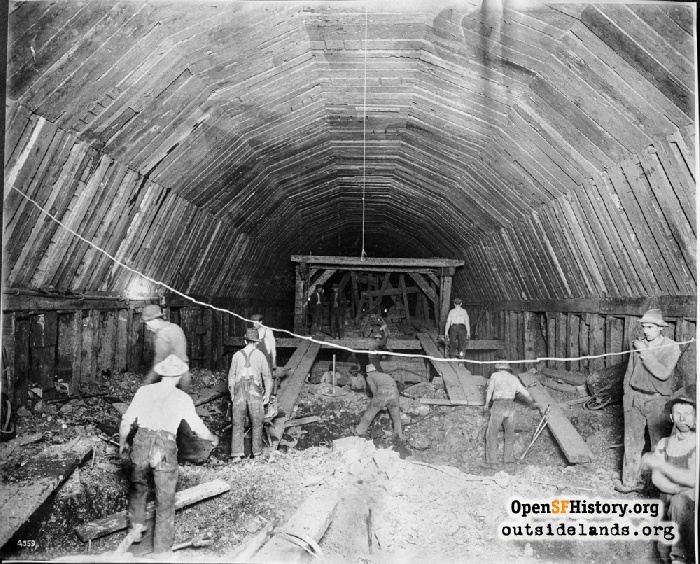 Storrie & Co. began excavation for the Twin Peaks Tunnel on December 11, 1914. 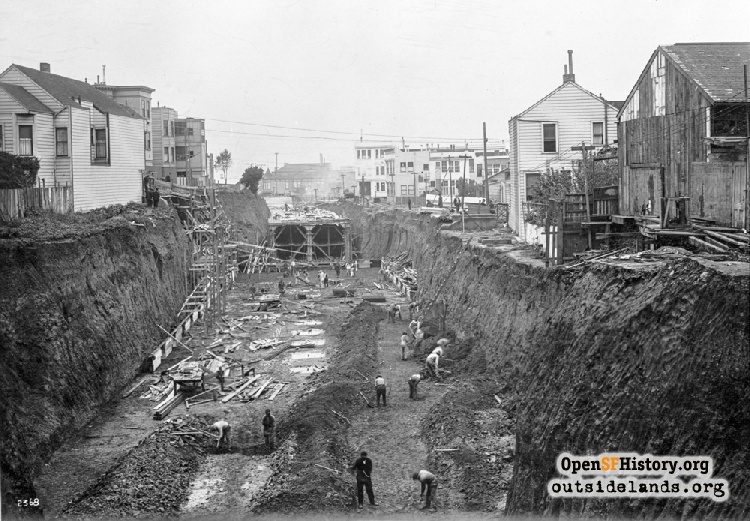 Work proceeded at three sites: the eastern portal near Market and Castro, the western portal near what would become West Portal Avenue and Ulloa, and at the Forest Hill Station at Laguna Honda. By June 1915, the contractor declared the work to be 25% completed and that the boring work was digging 30 feet per day. On July 2, 1915, Inspector Ernest Dunden of the Board of Public Works was inspecting the transformer stations at the west portal when he slipped and fell onto live wires. Although workers tried to pull him from the wires, the strong current hurled them back. Dunden became the first casualty of the construction. Several others were killed in the delayed explosion of a dynamite cap in February 1917. While construction was progressing, the city was considering how to best effect rail service through the tunnel. United Railroads owned rail franchises on Market Street east of the tunnel and on Sloat Boulevard west of the tunnel. San Francisco was desirous of having its nascent municipal railroad provide service through the tunnel. This presented a potential quagmire of having passengers get off one rail service to get on another to go through the tunnel unless the City and United Railroads could come to some kind of agreement. On December 8, 1915, O’Shaughnessy presented several options on resolving these conflicts to the Board of Supervisors’ Public Utilities Committee. One proposal had been for the city to construct its own rail line on Market Street next to the United Railroads tracks. Since United Railroads was vigorously opposed to this, O’Shaughnessy suggested that the city could lease the United Railroads tracks on Market Street, an exchange of transfers with United Railroads, or to extend planned Church Street tracks. O’Shaughnessy also advised that the city purchase the Sloat Boulevard and other rail lines west of the tunnel from United Railroads. Issues between United Railroads and the city continued to escalate in 1916. No doubt threatened by the competition from Muni, United Railroads refused to permit the city to cross over United Railroads tracks on Market for the Muni Church Street line and threatened litigation if the city constructed its own tracks on Market Street. Unable to strike a deal with United Railroads, in May 1916 the city directed O’Shaughnessy to draw up plans to extend Muni from Market Street, through the tunnel, and out to the ocean on Taraval Street and directed the Board of Works to complete the Church Street line extension on Market Street. In June 1916, the city began the construction of Muni tracks paralleling the United Railroads on part of Market Street. As threatened, United Railroads immediately went to federal court and obtained a temporary restraining order. This stopped the double track construction on Market Street until a hearing could be held and decision reached by the federal judge. 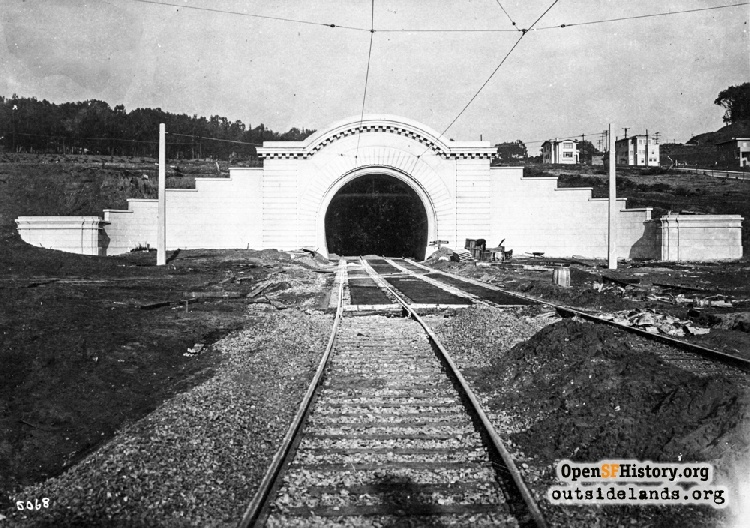 San Francisco did continue with track construction from its Church Street line to the eastern portal of the tunnel. Although the tunnel construction was continuing on schedule, it was not going fast enough for the Residential Development Company which had purchased a large part of the San Miguel tract back in 1911. Unable to make all of its assessment payments, it finally sold of 49 acres of land by the west portal of the tunnel to Fernando Nelson, the noted Richmond District developer for $300,000 in June 1916. Nelson would go on to develop much of the West Portal area. Curiosity was peaked in August 1916, when workers found a petrified redwood tree trunk 90 feet below the surface of the ground in sand and clay formations. Debate ranged as to whether redwood trees once graced the Twin Peaks area or whether the fossilized piece was once driftwood that came ashore in a much earlier time. It is unclear if scientists ever reached a conclusion. The hearing on United Railroads lawsuit against San Francisco occurred in August 1916 and the two sides submitted legal briefs thereafter. On January 18, 1917, Judge William Hunt ruled in favor of San Francisco, holding that United Railroads’ exclusive franchise rights to Market Street streetcar service did not extend to competition from the city itself. United Railroads immediately appealed, but would eventually lose their case in the United States Supreme Court in April 1919. Nearly eight years after the idea of a tunnel under Twin Peaks was first being discussed, it became a reality. “Holed through!” was the shout on Thursday, April 5, 1917, a traditional drillers’ cry when a tunnel is connected. The alignment of the tunnels from the two portals was off by a mere eighth of an inch where they met, an engineering marvel. A driller named Sam Campbell was the first man to squeeze through the initial narrow opening. Four supervisors, Edward Nolan, Joseph Lahaney, Cornelius Deasy, and Charles Nelson came down to the tunnel and rode “muck” cars drawn by cable to the opening. When they had traveled as far as the muck car would go, they got out and raced to see who could get through the opening first. Lahaney won the race, but his suit was muddied in the process. On June 15, 1917, a delegation from City Hall in a small fleet of automobiles drove over Twin Peaks on the new Market Street extension called Portola Drive. From there, they entered the western portal of the Twin Peaks Tunnel and drove through the bore to the eastern portal. It would be the first and last time that automobiles made the trek through the tunnel. A celebration of the completion of the tunnel occurred on July 14, 1917 at the eastern portal. Thousands came for the ceremony that included speeches by current and former city officials, including Mayor Rolph, who accepted the tunnel on behalf of the city. “Westward the course of empire takes its way,” declared Rolph. O’Shaughnessy took a few taps to get the ceremonial first spike for the tracks to be built through the tunnel started before Rolph finished it. After the ceremonies, people were permitted to walk the length of the tunnel. The tunnel had been completed four months ahead of schedule. 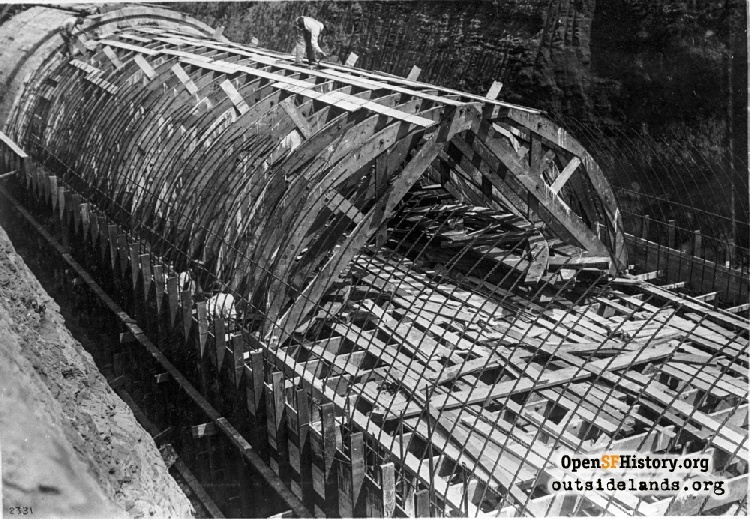 With the tunnel work completed, there still remained the issue of track construction through the tunnel, which began almost immediately, and how the tunnel tracks would connect with streetcar tracks on either side of the tunnel. Discussions with United Railroads included a universal transfer system and United Railroads leasing the tracks through the tunnel. Plans to double-track Market Street with new Muni tracks next to the existing United Railroads tracks met a lot of public opposition, but work proceeded forwarded anyway. With negotiations for some compromise with United Railroads stalled, Mayor Rolph on September 27, 1917, signed a resolution authorizing construction of new Muni tracks from the west portal of the tunnel to Taraval and 20th Avenue. Track construction from the western portal to Sloat and Junipero Serra Boulevards was completed by mid-December 1917. Previously approved track construction on Market Street from Church to the tunnel, which connected with existing streetcar lines on Market between Van Ness and Church, was also completed by then. The city ran the first Muni streetcar through the tunnel on December 31, 1917 to test the new tracks. For travel west of the tunnel, negotiations were on-going with United Railroads, which wanted the right to send its streetcars through the tunnel in exchange for Muni using its tracks on Sloat. O’Shaughnessy offered two other alternatives to the Board of Supervisors—bus service until new Muni tracks could be built out to the beach or the purchase of United Railroads lines, the latter of which the city engineer favored. Negotiations with United Railroads would drag through much of 1918. 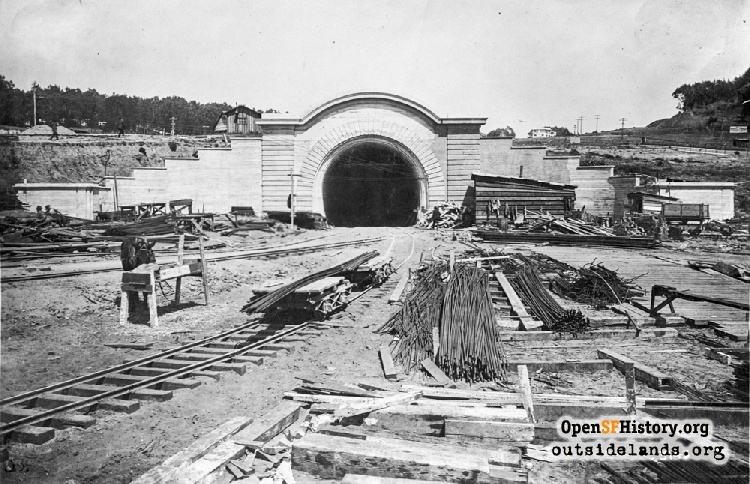 The grand opening of the tunnel was supposed to occur in January 1918, but a crossing to be installed at Castro and 17th Streets was delayed in its shipment from Pennsylvania by blizzards. 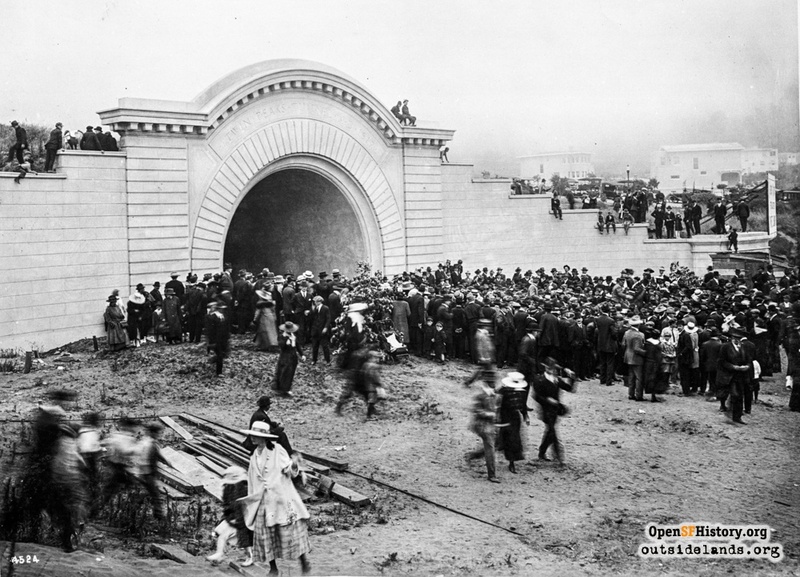 The grand opening of Muni service through the Twin Peaks tunnel finally arrived on Sunday, February 3, 1918. Crowds gathered on the Van Ness side of City Hall to watch the first streetcar take off at 2:30 p.m. Inside the car were Mayor Rolph, acting as the motorman, most of the Supervisors, the City Engineer O’Shaughnessy, some family members and guests, and President Reardon of the Board of Public Works, acting as the conductor. The public was invited to ride other streetcars, provided they paid the 5 cent fare of course. 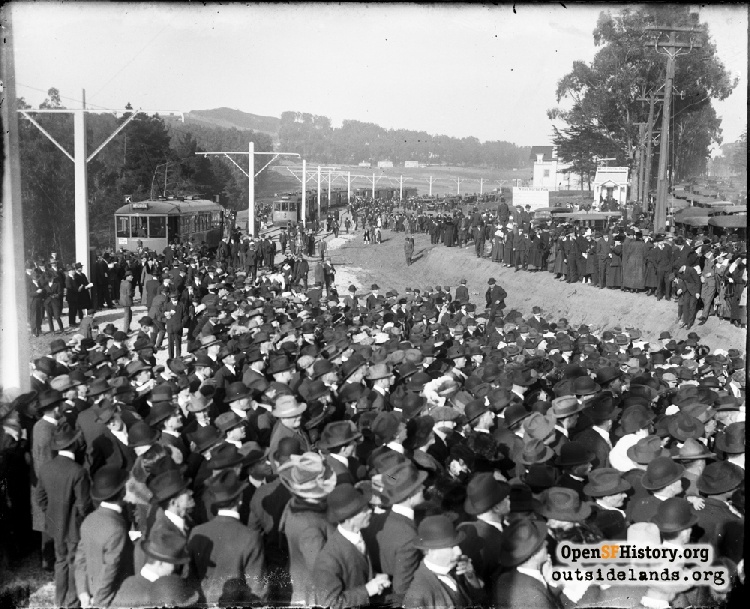 When the streetcar filled with city officials reached the eastern portal near Castro and Market Streets, hundreds of cheering people lined the tracks. The streetcar made its first stop inside the tunnel at the Eureka station near the eastern portal. After stopping at the Forest Hill station in the middle of the tunnel, the streetcar emerged at the western portal where a huge throng of people awaited. The streetcar continued on to Sloat and Junipero Serra Boulevards where a ceremony occurred. 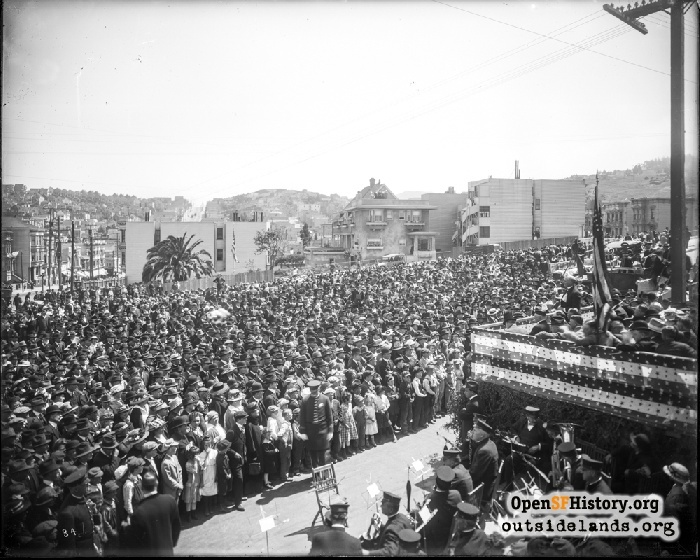 After some brief speeches where Mayor Rolph asked the crowd for patience while the city continued to work out issues of getting tracks to go all the way to the ferry building on Market Street, the city officials got back on the streetcar and made the return trip to City Hall. The opening of Muni service through the Twin Peaks tunnel proved irresistible to sightseers. On Sunday, February 10, 1918, over 21,000 people rode the streetcars out through the tunnel. In the first month of operation, over 238,000 fares were purchased. This proved to be a boon to the developers of the residential parks beyond the tunnel. Although not completed in time for the opening of the tunnel, the city’s work at double-tracking Market Street in order to provide streetcar service from the tunnel all the way to the ferry building was finished in May 1918. A planned celebration of the opening of the Market Street service on June 1, 1918 was cancelled due to the death of Mayor Rolph’s father. However, O’Shaughnessy and other city officials nonetheless led a fleet of streetcars in ceremonial trip down Market Street that day. The streetcars caused numerous traffic issues and the lead car, with O’Shaughnessy in it, was involved in an accident with a PG&E work wagon. Regular service on Market Street to the ferry building started June 2, 1918. However, for the bulk of 1918, Muni streetcar service stopped just west of the Twin Peaks tunnel while the city negotiated with United Railroads for use of their tracks in the Sunset district. The city provided bus service as a temporary means of getting passengers to their destination from the end of the Muni line, but residents were unhappy with that service. Agreement was finally reached in December 1918 whereby Muni could use the existing Taraval and Ocean Avenue streetcar lines in return for payment of $100,000 to United Railroads. The $100,000 could also be deducted from the purchase price if the city decided to buy the United Railroads lines west of the tunnel. The effect of the Twin Peaks tunnel was exactly as planned. In the 1910 census, San Francisco had a population of 416,912 people of which a quarter lived in the Outside Lands and southern districts. By the 1920 census, the city’s population had increased to 506,676 people. More than 60% of that increase was attributable to new residents in the Outside Lands and southern districts. The population made another huge increase to 634,394 people by the time of the 1930 census. While it is difficult to track how much of this increase was a result of new residents to the west of Twin Peaks, city assessments showed huge increases for these areas between 1912 and 1928. Muni continued in competition with United Railroads, which became the Market Street Railway in 1921. Muni finally purchased the Market Street Railway and merged the systems in 1944. By this time, Muni had three routes operating through the Twin Peaks tunnel, the K Ingleside, the M Ocean View, and the L Taraval. With the construction of a BART and Muni Metro subway under Market Street in the late 60s and early 70s, an underground connection was created between the subway and Twin Peaks tunnel. The underground Eureka Station was abandoned at this time in favor of a new underground Castro station. Today, 100 years after the opening of the Twin Peaks tunnel, thousands of people continue to commute through it every day. Even with the proliferation of the automobile and more and better roads throughout the city since the tunnel opened, it remains an easier and more cost effective method for many to reach jobs, stores, and events located in the eastern part of San Francisco. The tunnel, an engineering marvel in 1918, has stood the test of time ever since. Full list of sources for this article. Page launched 3 February 2018.